Agencies are indispensable partners in helping marketers differentiate their brand. Differentiation is, after all, the essence of branding. But when it comes to their own brands, most agencies haven’t thought through their own brand touch points to look for opportunities to stand out. But the point is not to be different just for the sake of being different, but rather to be different in relevant ways. You could think of these two factors – differentiation and relevance – plotted as a vertical and horizontal axis. Obviously, it’s possible to be different without being relevant (quadrant 4). 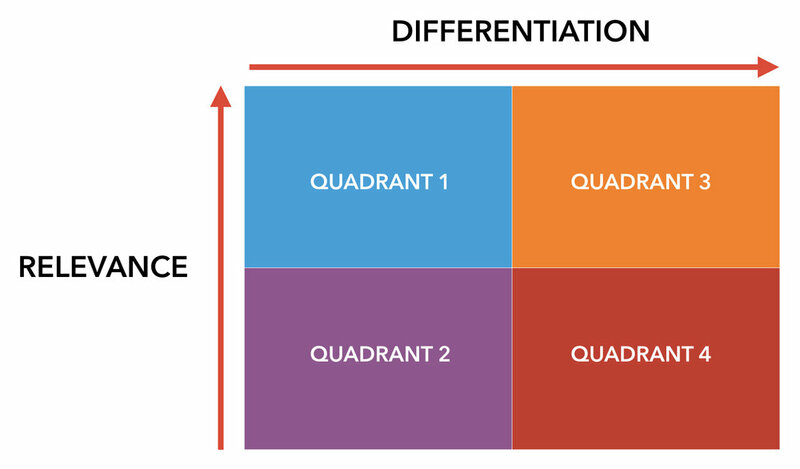 It’s also conceivable that the elements of your agency brand might be relevant to your target clients, but they’re not very differentiated, and therefore don’t look any different from any other agency (quadrant 1). Quadrant 2 is clearly the worst place to be. The high ground is in quadrant 3, where your product, people, process, and place of business are all relevant to client needs and highly differentiated from other firms. Engage your management team in a discussion of how to move the agency into quadrant 3 in every possible dimension you can, from the way the agency is structured to the way you bill for your services. In the end, nothing will enhance your branding credentials more than doing a great job of branding and differentiating your own firm.